You have always heard that in ancient times salt was like gold, but why is that? Salt is the original preserving mean. Meat cured in salt doesn’t spoil, cheese soaked in brine lasts longer, and those foods could then be stored for long travels, colder months, or times of famine. Cervia, a small town on the Adriatic coast of Italy whose main trade has traditionally been in salt, has always been considered a prized domain by the Pope State exactly for this reason. Salt has been for a very long time a state monopoly in Italy, so all production was sent to be repackaged at a central government facility. Only in the past five years the salt monopoly has been lifted, allowing salt producing facilities to brand their products. So, instead of getting whatever salt you can get at the Sali e Tabacchi store (the designated monopoly outlet where you buy all tobacco products and lottery tickets- and where you used to buy salt as well!) you can pick a local salt, from a given salt pond. Since Cervia is about 2 miles from my hometown, smack in the heart of Romagna, I am partial to Cervia’s salt! The salt ponds in Cervia are fortunately alive and well. They survived modernization and mechanization, and some of the ponds are still harvested by hand, making for an extraordinary open air museum of salt heritage! 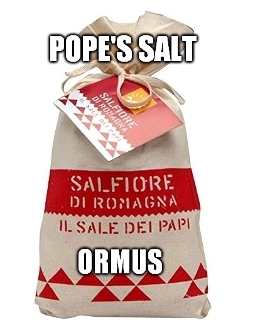 Sal Fiore (flower salt, the same fleur de sel of French celebrity) is a fine sea salt, still called sale del papa (Pope’s salt), as traditionally the first harvested salt was delivered to Rome to be used on the Pope’s table. Given this important historic background, the salt producers in Cervia decided to brand their salt as Sale Dei Papi, the Popes’ salt. An important name! In 2004, Slow Food recognized Salina Camillone (a salt pond, pictured above) as a Presidia, to preserve the production, harvesting methods and the quality of the product. Two salts are then recognized as the diamond head of Cervia’s production: the Salina Camillone salt and the Salfiore di Romagna, the Popes’ Salt. Both Salina Camillone salt and Sal Fiore are completely natural: they dry by sunlight, and no additivies or anti-caking agents are added to the final product- not even iodine, as sea salt naturally has it! Sal Fiore is a fine salt, the first one to be harvested in the traditional method, and it’s a perfect finishing salt, as its crunchy texture and sharp sea taste make for an interesting touch on salads and steamed vegetables. The salt from Salina Camillone is instead very coarse, harvested by hand in limited uquantities every day, from June till September. The Camillone salt pond has been harvested in the same way since Roman times, and the salt it produces is somewhat more humid than other sea salts, making for a terrific ingredient in salt crust recipes.